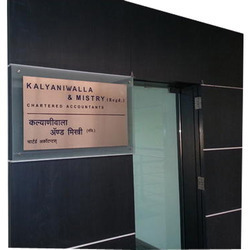 Manufacturer of a wide range of products which include bronze nameplates and filled label bronze nameplate. Owing to the vast experience in this field, we have emerged as one of the leading manufacturers, suppliers, and exporters of a wide array of Bronze Nameplates. Driven by an intense desire to achieve perfection, we assure effective, safe, flawless, and timely delivery of our products. These products are widely used for embossing names and other such data to be used as nameplates for homes or offices. We are engaged in offering Filled Label Bronze Nameplate, which can be easily found in homes and offices. Providing many years of dependable identification, these nameplates are etched on bronze metal and then filled with long lasting, colorful baked enamels and epoxies. Made available in various shapes and dimensions, presented nameplates offer supreme finish and maximum durability. Looking for Bronze Nameplates ?